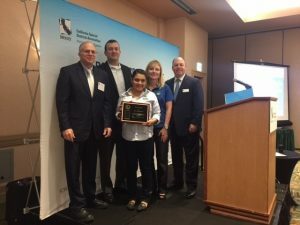 The Madera Irrigation District (District or MID) was recently awarded the “District of Distinction” accreditation by California’s Special District Leadership Foundation (SDLF). The District was recognized in 2016 for its achievements in the areas of governance, transparency, finances, and board conduct. 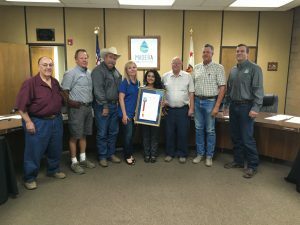 “Madera Irrigation District is proud to receive this highly prestigious recognition by SDLF. It is a testament to the emphasis placed on good governance by the District’s Board of Directors and Staff in recent years” stated Thomas Greci, General Manager. The District of Distinction accreditation is among California’s highest government honors. Out of almost 2,100 special districts in California, MID is one of only thirty-three (33) special districts to receive this distinction. To receive the accreditation, a special district must demonstrate the completion of essential governance transparency requirements including conducting ethics and harassment training for all board members, properly conducting open and public meetings, and filing financial transactions and compensation reports to the State Controller in a timely manner. The District received the prerequisite Transparency Certificate from SDLF in 2015. SDLF is an independent, non-profit organization formed to promote good governance and best practices among California’s special districts through certification, accreditation and other recognition programs. In addition to the recognition through SDLF, the MID was acknowledged by California State Assemblyman Frank Bigelow with a State Assembly Resolution for receiving the District of Distinction accreditation. Listen to what MID farmers have to say about surface water usage. Click below to learn more. Copyright © 2019 Madera Irrigation District. All rights reserved. Web Design by Digital Attic.